Nyle DiMarco’s journey towards celebrity began when he applied to America’s Next Top Model as a possible competitor. (His friends urged him to.) He was accepted for Season 22, and figured he’d be eliminated quickly. He ended up winning first place in the competition, and Tyra Banks became a mentor and enthusiastic fan. The show gave him valuable experience in working with photographers and staff, and learning how to carry and project himself as a professional. Afterwards, he resumed modeling. 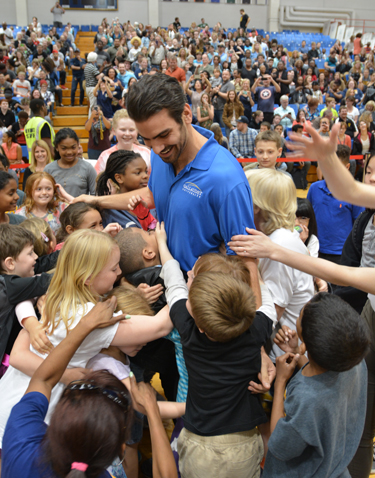 Utilizing his newfound celebrity, he founded a new nonprofit, the Nyle DiMarco Foundation, to advocate for deaf children’s language rights and provide guidance for parents. He has also been outspoken in support of LGBTQ rights—he was one of the guest speakers at the Human Rights Campaign’s 2016 Dinner. He was then invited to join the competition on Dancing with the Stars (another lucky Season 22). This was, if anything, a more formidable physical challenge than ANTM, as he had to learn a variety of dance styles from scratch, without being able to derive cues from the music, and to perform as smoothly as a professional. He had to learn how to work with his assigned partner, Peta Murgatroyd, who had never worked with a Deaf person before. That they succeeded magnificently goes without saying. Murgatroyd and DiMarco likely put in far more time rehearsing than the other teams, learning to coordinate their moves through visual cues or touch. They won first place. DiMarco did such a fine job that Cliff Joannou, who interviewed him for Attitude Magazine, suspected him of having superpowers. Of course, DiMarco bluntly denies being superhuman, although he does admit that being Deaf may give him an advantage, as he learned early on to rely on his keen perception, visual acuity, and intuitive understanding of expressions and movement (an integral spect of ASL). He’s been busy with modeling, a variety of projects, including TV plans, and fundraising for his Foundation. We wish him the best of success in his endeavors.